In total the suggested improvements to complete a new, high-speed Northeast Corridor will cost approximately $68 billion over 25 years. These costs do not include the purchase of new high-speed rolling stock since, under the proposed organizational changes, this expense would fall to a privatized Amtrak or alternative future high-speed operator. Under the preferred phasing, annual expenditures would amount to $2.5 to $3.5 billion per year and would be apportioned among the various agencies charged with the implementation of the various upgrade segments. 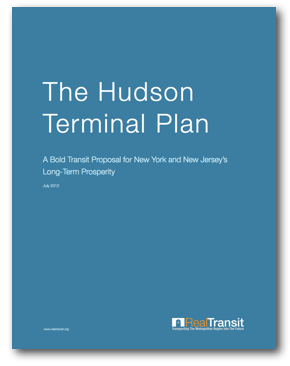 In terms of phasing, the highest priority segment is the Hudson Terminal Plan, because without the proposed New York- based capacity improvements, the benefits from upgrades to other segments of the overall plan cannot be fully realized. In addition, the construction of the a new northern alignment of the Northeast Corridor requires the implementation of the Hudson Terminal Plan. Finally, because it offers the greatest opportunities to capture value from associated TODs, the Hudson Terminal Plan will help to create a steady revenue source for future improvements. Concurrently with the Hudson Terminal Plan, Phase I improvements will begin on the southern section of the Northeast Corridor. By the end of the 10th year of implementation, the bulk of improvements from New York to Washington will be complete, and trains traveling on this segment will benefit from significantly reduced travel times. The full implementation of the suggested improvements to the Northeast Corridor will allow for maximum speeds of 220 miles-per-hour. However, travel times across various segments would be reduced incrementally as higher speeds were achieved during phased construction. With the completion of the Hudson Terminal Plan and Phase I improvements to the southern section of the Northeast Corridor, express trains traveling from New York to Washington will be able to complete the trip in approximately two hours, and trains traveling from New York to Philadelphia would be able to complete the trip in approximately 45 minutes. The highest priority segment during the second decade of construction is the high-speed alignment to Stewart Airport, which would in turn drive demand for the remainder of the northern section of the Northeast Corridor and further increase revenue generation. If implemented concurrently, high-speed Northeast Corridor improvements from Washington to Stewart Airport will be completed by the end of the 17th year of construction. The remaining segments from Newburgh to Boston will be completed by the end of the 25th year of construction. Upon completion of all of the suggested upgrades, express trains traveling from New York to Boston will be able to complete the trip in approximately 110 minutes, and express trains traveling from Washington to Boston will be able to complete the trip in approximately three hours and 20 minutes. During the first ten years of implementation, annual costs would stay below $3 billion per year. 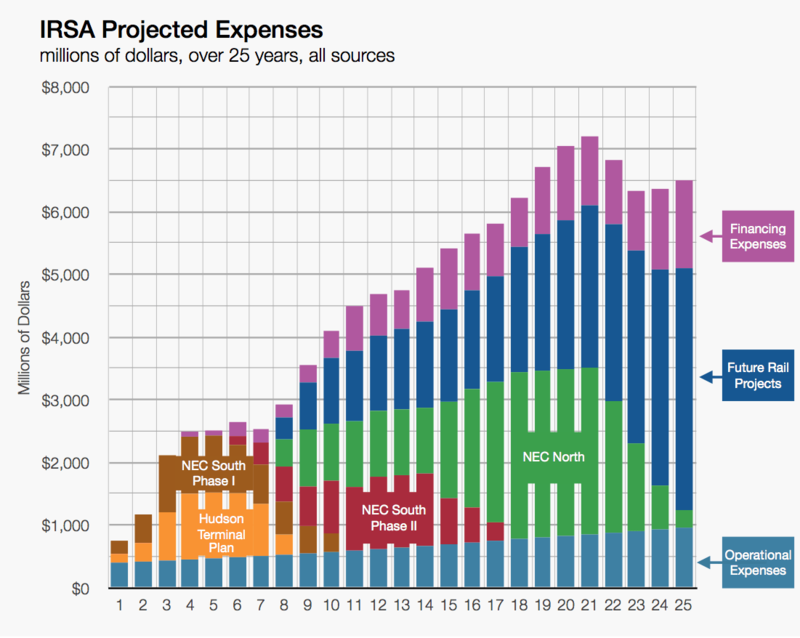 With the growth of revenue generation in the second decade of implementation, costs would peak at $3.8 billion per year across the entire Northeast Corridor project. 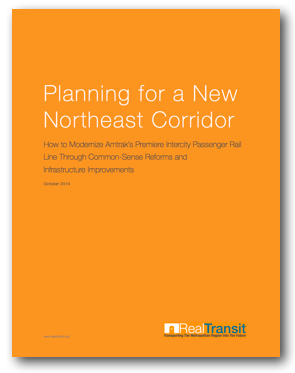 The combination of faster travel times, improved stations, and a shifting preference for rail will dramatically increase ridership on the Northeast Corridor over the next several decades. 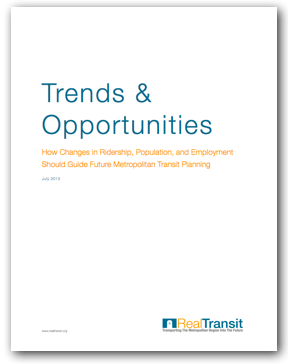 The largest increases in ridership will come from current air and automobile trips along the most trafficked routes in the Northeast Corridor region. 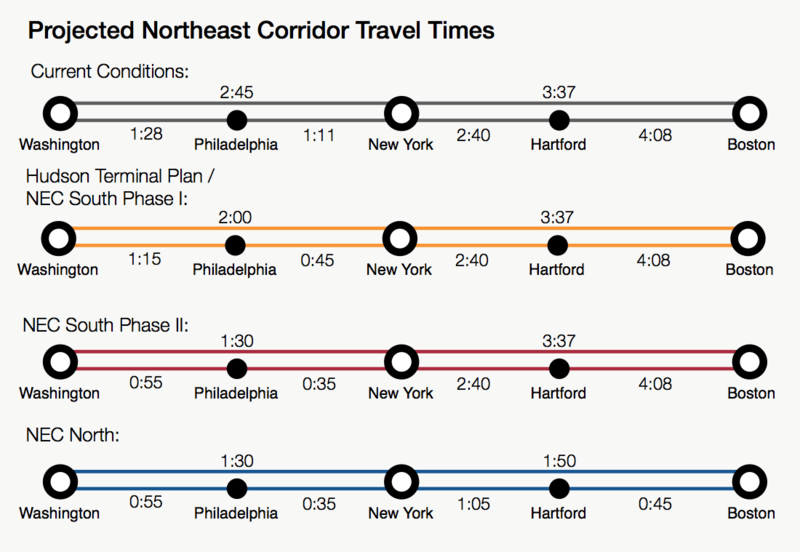 While induced demand will contribute to ridership increases across the entire Northeast Corridor, the largest gains will be realized over the New York to Hartford segment where opportunities for new TODs and commuter service are greatest. In addition, the induced demand from an expanded Stewart Airport, which would itself serve passengers from New York, New Jersey, and Connecticut, would contribute to significant ridership gains. Currently, JFK Airport’s AirTrain, which does not terminate in Manhattan, is used by just 10% of the airport’s 50 million annual passengers. With a direct, high-speed connection from Stewart Airport to Manhattan, ridership as a percentage of total air passengers would be significantly higher. Further, since it would be within an hour’s travel from Danbury, Waterbury, and Hartford, Stewart Airport will also serve as a regional airport for western Connecticut, which would induce additional demand. If the implementation of the overall plan began in 2015, after the completion of the Hudson Terminal Plan and first phase of improvements to the southern section of the Northeast Corridor in 2025, ridership would amount to approximately 20 million annual passengers. With the completion of the second phase of improvements as well as the opening of the New York to Stewart Airport segment, ridership would eclipse 40 million annual passengers by 2032. By 2040, with the full Northeast Corridor improvement plan completed, ridership would amount to approximately 55 million annual passengers. The suggested improvements to the Northeast Corridor will require significant public investments over the next several decades. In assessing the feasibility of the suggested plan, a useful comparative analysis in terms of scope is the implementation of the Interstate Highway System, which ultimately resulted in $500 billion (2014 dollars) in capital spending over the course of four decades. In order to ensure the long-term investment needed to construct the Interstate Highway System, the Interstate Highway Act of 1956 established a revolving Highway Trust Fund, which is replenished through a combination of fuel taxes, access fees, and investment interest. The 1956 Act appropriated $16 billion (2014 dollars) in spending for the first segments of interstate highway construction, after which the remainder of funding was to come directly from the trust fund. Like the Interstate Highway System, it is not enough to simply appropriate segmental funding in order to construct the suggested improvements to the Northeast Corridor. As discussed earlier in this report, a new protocol for rail infrastructure financing must be established to allow for the implementation of not only the upgrades to the Northeast Corridor, but also intercity rail improvements in other regions of the country in the future. Thus, similar to the enactment of the Interstate Highway Act of 1956, the suggested legislative changes that would create IRSA, privatize Amtrak, and establish the Interstate Rail Infrastructure Trust Fund (IRITF) must also include an initial appropriation that would ensure the long-term feasibility of both the proposed improvements to the Northeast Corridor as well as other future IRSA projects. The IRITF would serve as the revolving fund for revenues generated from IRSA’s operating, investment, and financing activities. 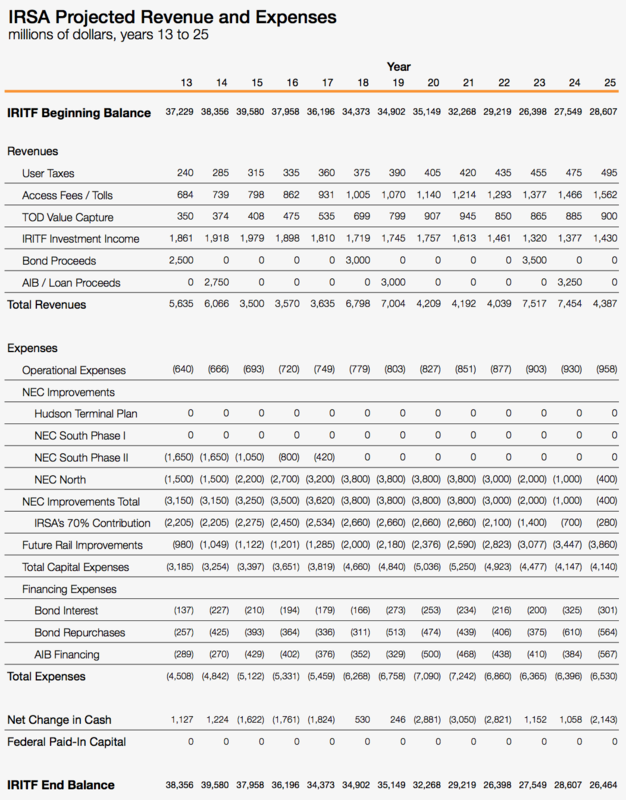 The IRITF would also fund IRSA’s operating expenses (track and signal management, utilities, maintenance, etc. 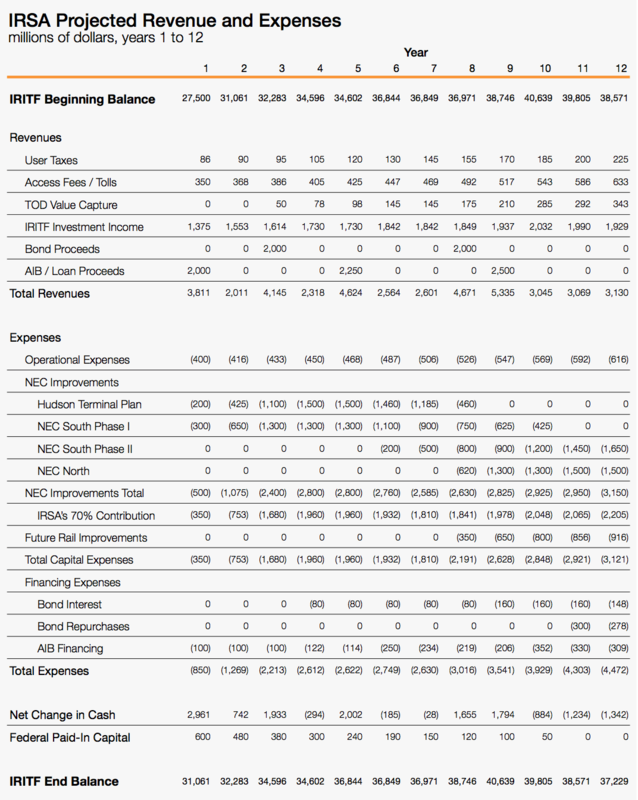 ), investment expenses (infrastructure improvements, fund investments, etc. ), and financing expenses (interest payments, bond repurchases, etc.). One of the new streams of revenue flowing into the IRITF would come from a ticket-based user tax. Currently, for air travel in the United States, passengers pay a 7.5% excise tax on every air ticket purchased, which in turn funds the Airport and Airway Trust Fund (“AATF”). In addition, the AATF is also funded by a tax of $3.70 imposed on amounts paid for each segment of domestic travel and, if applicable, a tax on the use of international air travel facilities (also known as the international arrival/departure tax) of $16.10 for international travel that begins or ends in the United States. The AATF helps to fund the Federal Aviation Administration, which, among other duties, manages the air travel infrastructure including the air traffic control system, provides grants to airports, and oversees the safety of the airline industry. Similar to the taxes imposed on airline travel, which help fund improvements and maintenance of the airline industry’s infrastructure, IRSA must also generate revenue from taxes imposed on travel on IRSA-owned rail infrastructure. At an average Northeast Corridor ticket price of $100 and projected 2015 ridership of 11.5 million, a 7.5% tax per ticket would yield revenues of over $86 million within the first year of the plan’s implementation. Projected increases to intercity rail ridership could generate tax revenues of $200 million per year by the 10th year, and $500 million per year by 25th year. Another source of revenue for the IRITF will come from access fees and tolls from train operations on IRSA-owned rail infrastructure. Today, of the 2,200 daily trains on the Northeast Corridor, eight commuter lines and three freight lines pay Amtrak approximately $200 million in negotiated access fees. Upon its acquisition of the Amtrak-owned portions of the Northeast Corridor, IRSA will similarly obtain access fees from the various railroads, but with the addition of Amtrak as well. While Amtrak currently operates at a profit on the Northeast Corridor, its access fees do not cover the required infrastructure-based costs needed to manage and maintain the Northeast Corridor. Further, access fees may be used to help to reduce congestion through the utilization of segmental tolls in addition to a general access fee. Projected access fees and tolls along an IRSA-controlled Northeast Corridor would generate approximately $350 million in 2015, which, with the expansion of capacity and installation of higher-speed rail, would increase to over $1 billion by the 25th year of the overall plan. 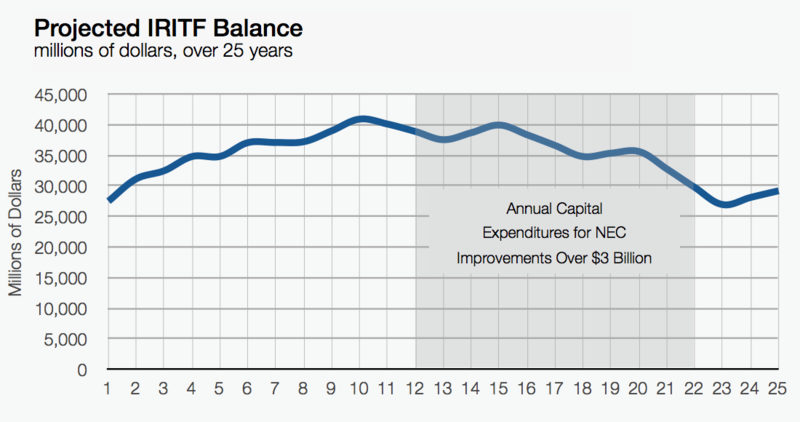 In addition to rail-based revenue, the IRITF will also generate income from TODs developed alongside the proposed Northeast Corridor infrastructure improvements. Today, for the MTA’s 7-Line Subway Extension, the HYIC’s combined total of value-capture revenue from the project’s commencement in 2006 to its planned completion in 2015 is projected to equal approximately 16% of total infrastructure costs. However, the 7-Line Subway Extension has not yet opened for service, and the HYIC has yet to realize any PILOT or TDR revenue to date. Looking five years past the completion date, the HYIC estimates that the percentage of value-capture revenue from TODs will rise to about 25% of total infrastructure costs, and may reach 35% by the end of 25 years after the start of the project. While certain segments of the suggested improvements to the Northeast Corridor offer significant opportunities for TODs, as a whole, the project will not be as TOD dependent as the 7-Line Subway Extension. Thus, for the purposes of analyzing feasibility, initial projections for TOD revenue were conservatively set at 3% of infrastructure costs beginning in the 3rd year of improvements, which would then rise to 12% by the end of the 15th year, and 18% by the end of the 20th year. In terms of financing revenue, the feasibility analysis suggests the incremental sale of $13 billion in bonds over the 25- year life of the project. These bonds would be issued every five years starting at year three and would be secured and repaid by proceeds from IRSA’s other streams of revenue such as taxes, access fees, and TOD value-capture income. In addition, the feasibility study presumes the incremental repurchase of these bonds starting in year 12 to reduce overall long-term debt levels. Another source of financing revenue would come from loans from a newly created American Investment Bank as well as other public and private sources such as the US DOT’s TIFIA program and the FRA’s RRIF program. Total loan proceeds would amount to $15.8 billion over 25 years, and the loans would also be made in smaller increments over the life of the project. While current lending for similar projects involves interest rates below 4% and loan terms in the 35-year range, for the purposes of analyzing feasibility of the overall plan, a 5% interest rate and 30-year term was used. 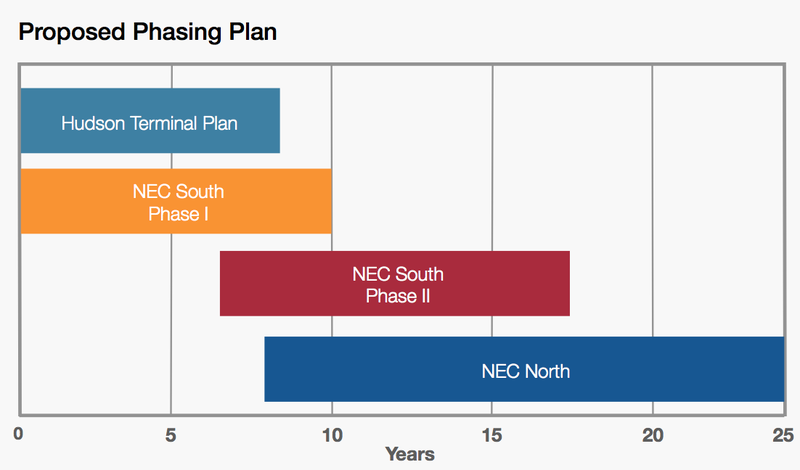 In addition to the capital expenditures for improvements to the Northeast Corridor, the feasibility analysis also includes significant capital expenditures for future high-speed rail projects in other parts of the country commencing after the completion of the Hudson Terminal Plan and the first phase of improvements to the southern section of the Northeast Corridor. 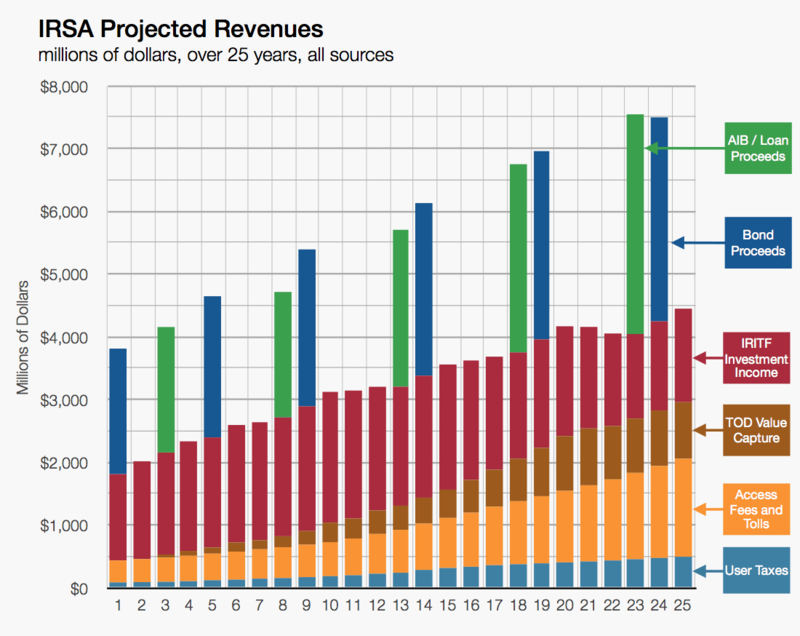 These future capital expenditures would begin in year 8 and rise to over $2 billion by year 18 and $3 billion by year 23. Over the life of the 25-year project plan, IRSA would, in addition to the improvements to the Northeast Corridor, be able to fund nearly $50 billion in rail infrastructure projects elsewhere throughout the country and over $75 billion worth of projects through year 30. In terms of expenses, the suggested infrastructure improvements to the Northeast Corridor will cost approximately $68 billion over 25 years. However, along with IRSA (the suggested federal participant), state and local beneficiaries of shared infrastructure improvements must also contribute towards the various segmental costs. Typically, for large-scale transportation projects falling under the various federal funding programs, the federal government contributes 35% to 75% of the total costs. In keeping with this scheme, the total contribution from state, local, and private participants should range from 25% to 65% depending on the diversity of benefits to the various participants. For the Hudson Terminal Plan, for instance, federal contribution is estimated to amount to only 35% of total costs because of the involvement of various state and local participants. For the purposes of the feasibility study, IRSA’s share of infrastructure costs was set at 70% across the entire project. To achieve sustainability and avoid the problems currently facing the Highway Trust Fund, the IRITF will require an initial appropriation by the federal government. This appropriation would represent the total cost to the federal government for not only the improvements to the Northeast Corridor, but also future improvements to the nation’s high-speed rail infrastructure. An initial appropriation in the $5 to $15 billion range would result in insolvency of the IRITF prior to the completion of the 25-year project, thus requiring the utilization of additional financing or federal paid-in capital that may create long-term instability. 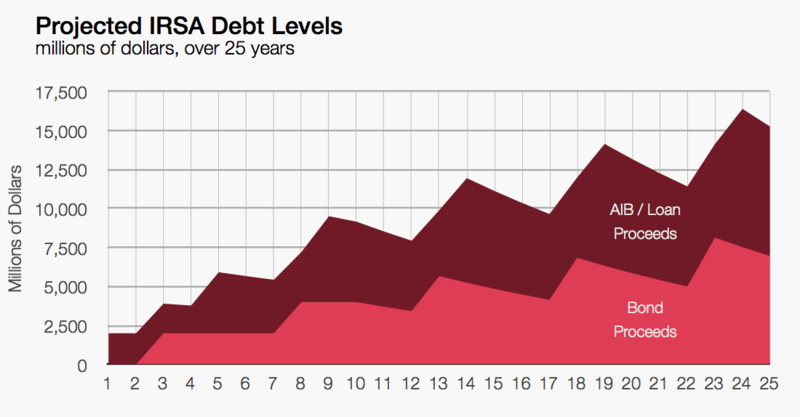 An initial appropriation in the $20 billion range would allow for solvency throughout the length of the 25-year project, but would result in likely insolvency by the 30th year. An initial appropriation in the $30 to $40 billion range would result in solvency throughout the length of the 25-year project and also create lasting fund growth that would diminish the need for reliance on financing for capital expenditures in future decades. Based on projected sustainability, and in order to reduce overall costs, a recommended initial appropriation of $27.5 billion would provide for long-term feasibility of the project as well as modest growth to the fund balance over time. By comparison, the federal government has provided $15 billion in subsidies to Amtrak over just the last ten years. These subsidies could be completely eliminated with the privatization of Amtrak and creation of IRSA. There are a number of extraordinary assumptions that, if adjusted, would result in alternative outcomes for the feasibility analysis. For instance, the annual IRITF interest income was set at 5% of the fund’s value, even though long-term investment income for similarly-sized funds falls within the 8% to12% range, which would result in significantly higher revenues. In addition, Amtrak currently owns approximately $10.4 billion in property and equipment, which includes tracks, stations, right-of-ways, and rolling stock. Upon IRSA’s formation, Amtrak will liquidate a large portion of these assets, which would result in an influx of cash to the IRITF. However, because the amount and distribution of the proceeds from the liquidation of these assets is speculative, they were not included in the initial appropriation to the IRITF. The IRSA feasibility analysis also assumes the elimination of federal grant subsidies for capital expenditures. If the federal government were to continue allocating capital funding to the IRITF in the future, IRSA would become less reliant on debt financing for revenue generation. For comparative reference, over the past decade, Congress has allocated approximately $65 billion into the Highway Trust Fund to prevent insolvency. Overall, assumptions made by the feasibility analysis were set at conservative ranges to avoid overestimating revenue and underestimating expenses.